The "Vitsentzos Kornaros" which suffered a mechanical failure in Piraeus on June 16, 2017, and was being laidd up in Perama since Jue 22, was scheduled for auction on Apr 3, 2019. The "Vitsentzos Komaros" suffered a failure of one of main engines shortly after leaving Rhodes on Jan 2, 2017, at 5.30 a.m. and had to return to port. The trip was cancelled, and the passengers had to board other ferries. On Jan 2 the ship was still docked at Rhodes. 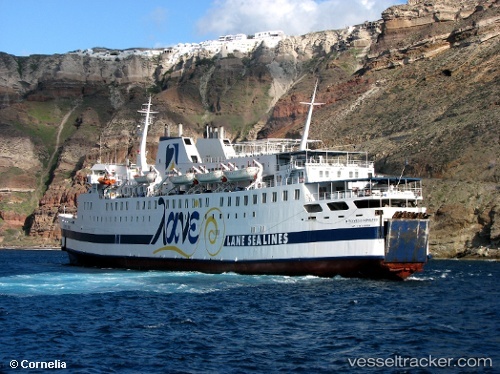 She was sailing again on Jan 4 and headed to Anafi, ETA 11 a.m. In the afternoon of Jan 3, 2016, the "Vitsentzos Kornaros" allided with a pier while leaving Kissamos for Piraeus with 16 passengers and cars on board. The vessel suffered damage above the waterline, and the sailing had to be cancelled as the ferry was detained for repairs.